Rinse away a day of digging beds, planting trees and pulling weeds with our Handmade Gardener’s Soap. Its vegan base of mostly coconut oil forms a high lather in cold hose water for cleaning up outside, and it’s crafted with local cornmeal and rosemary and perfect for scrubbing hands and nails—and feet for those who tackle yard work barefooted. 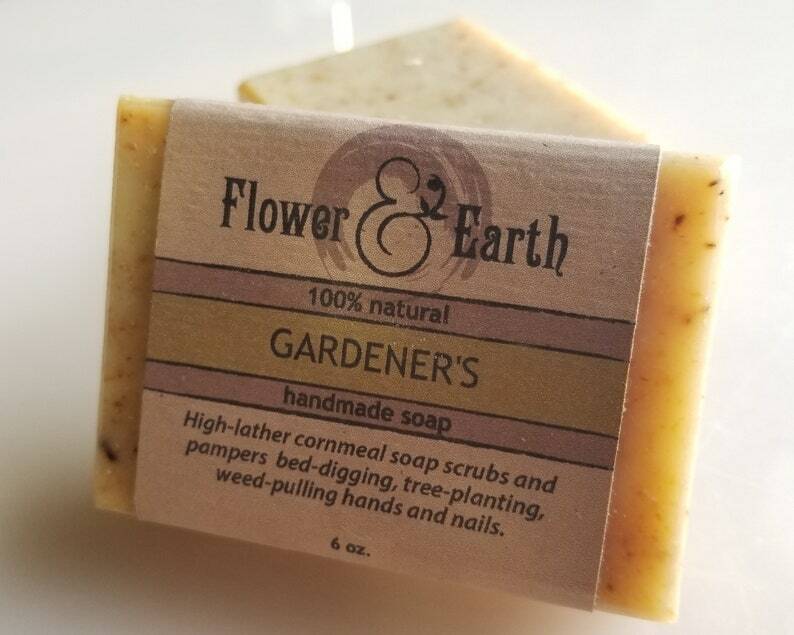 Scented with French lavender and dark patchouli oils, our Gardener’s Soap is a spa-like experience for the casual green thumb or professional landscaper. Cinnamon Stick Soap: Bar Soap with Clay and Cinnamon Essential Oil. Natural, Vegan, Essential Oil, Olive Oil Soap. Ecofriendly. PlasticFree. Double Cedar Bar Soap with Activated Charcoal, Red Clay, Rose Clay. Natural, Vegan, Essential Oil, Olive Oil Soap. Ecofriendly. PlasticFree. Ever Green Soap: Bar Soap with Bentonite Clay, Fir, Pine, Cinnamon. Natural, Vegan, Essential Oil, Olive Oil Soap. Ecofriendly. PlasticFree. Summer Night Soap: Bar Soap with Sweet Orange, Clove, & Patchouli. Natural, Vegan, Essential Oil, Olive Oil Soap. Ecofriendly. Plastic Free. Summer Night Salve: Vegan Hand Salve with Sweet Orange & Patchouli. All Natural Essential Oil Hand Salve. Cuticle Cream. Shea Butter Salve. Essential Oil Perfumes in Summer Night, Slate & Earth Mamma Blends, Lavender and Patchouli with Organic Jojoba Oils. Natural Perfume Oils. Oatmeal Soap: Soap Bar with Oatmeal. Unscented Soap. Scrubby Soap. Natural, Vegan, Essential Oil, Olive Oil Soap. Ecofriendly. Plastic Free. Mechanic's Soap: Pumice Soap with Bentonite, Lavender, Patchouli, Lemongrass, Peppermint Oils. Natural, Vegan, Coconut Soap. Plastic Free. All Natural Handmade Bar Soaps. Set of Eight. Vegan, Essential Oil, Olive Oil Soap. Ecofriendly Skincare, Gift Item. PlasticFree. Bulk Soap. Rosemary Mint Shave Soap with Clay, Rosemary, Peppermint, Lavender Oils. Natural, Vegan, Essential Oil, Olive Oil Soap. Zero Waste Shave. Tea Tree Shave Soap Bar with Tea Tree, Lavender, & Patchouli Oils. Natural, Vegan, Essential Oil, Olive Oil Facial Soap. Zero Waste Shave.